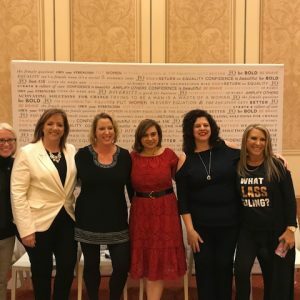 Women In Retail Leadership Circle | The Girls’ Lounge @ Shoptalk Was a Huge Success! I’m so excited to share that the inaugural Girls’ Lounge @ Shoptalk was a huge success! At last count about 500 women (and men!) walked through the doors of the Girls’ Lounge @ Shoptalk, and by all accounts everyone enjoyed their experience! The Power of Women in Retail panel offered some great inspiration from speakers like Tina Sharkey, co-founder of Brandless; Rachel Drori, founder of Daily Harvest; Marisa Bertha, director of business development and 7-ventures at 7-Eleven; and Sophie Miller, head of shopping partnerships, Google AR/VR. Want to check out what was discussed? Check out this Facebook post to view the Power Women in Retail panel in its entirety. The Girls’ Lounge wasn’t the only place women were highlighted at Shoptalk. The fast-growing event did a great job representing women throughout the conference. In its conference guide, Shoptalk noted that it’s “acutely aware of the need to ensure that the perspectives of women leaders are heard on stage and consider it one of its most critical responsibilities.” The conference featured more than 100 women speakers. In 2017, 30 percent of Shoptalk speakers were women; that percentage increased to one-third in 2018. Bravo Shoptalk! And bravo to the Girls’ Lounge @ Shoptalk! Pictured above in the Girls’ Lounge @ Shoptalk: Sarah Alter, CEO, Network of Executive Women; Julie Janckila, Director of Corporate Partnerships, Network of Executive Women; Jennifer DiPasquale, Executive Vice President, Total Retail, and Co-Founder, Women in Retail Leadership Circle; Simran Rekhi Aggarwal, Founder and President, Shoptalk; Melissa Campanelli, Co-Founder, Women in Retail Leadership Circle, and Editor-in-Chief, Total Retail; and Shelley Zalis, CEO, The Female Quotient. Summit Dreaming Women Rule at the NRF Big Show Here’s to Women Keynote Speakers! See You in Las Vegas?